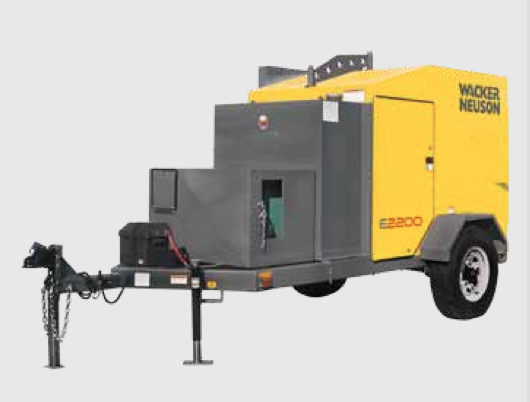 Looking to rent the Wacker Neuson professional-grade Ground Heater Rental – E2200 – for use at your job site in Rochester NY, Ithaca NY and Western New York? Widely respected under the former Ground Heater name and now manufactured by renown Wacker Neuson, the E2200 is precision engineered for starting consistently, trouble-free and for operating for an astounding 130 hours of run time. This rental heater is equipped with 2,200 feet of hose to enable use for a wide variety of applications. Consistent, smooth delivery of heat for both thawing and curing via the positive displacement pump. East to use and adjust digital temperature controller. Strobe light can be viewed from a distance, notifying operator of trouble-free operation.